winPenPack is an open source software environment comprised of several portable applications grouped into suites (portable applications are applications that are modified to be executed directly from a USB flash drive, without prior installation). With winPenPack, any USB flash drive ceases to be a simple data storage device and becomes a self-contained environment, within which programs and files are homogeneously integrated. Portable applications included in the winPenPack suites do not require any installation, do not leave their files or settings on the host computer, and can be easily transferred to another computer through any external device, such as a removable hard disk drive or a USB flash drive. 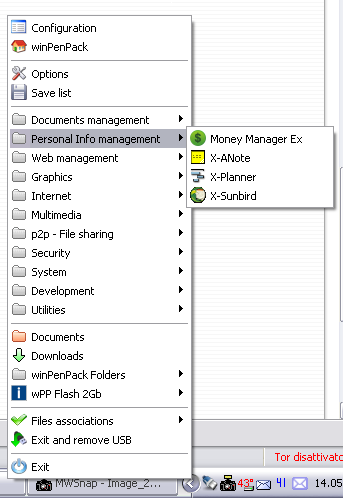 All you have to do is connect a USB flash drive to any free USB port on your host PC, and you will have your collection of pre-configured and ready-to-use programs instantly available, grouped in categories and executable through a user-friendly menu interface similar to the Start Menu, the winPenPack Menu. It will be exactly as if you are working on your own PC, with web browsers, e-mail clients, image and drawing editors, chat clients, multimedia tools, PC maintenance and security tools, school and development tools, etc. Everything you need, completely free! All these features make winPenPack extremely useful in any situation. 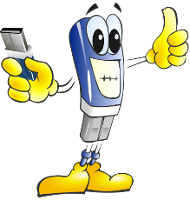 Depending on your USB flash drive capacity, you can choose between winPenPack 32-bit and winPenPack 64-bit, containing a collection of the best open source software available on the Internet, modified to achieve perfect software portability and divided into categories: Graphics, Multimedia, Internet, Office, System, Security and Utilities. You can also create your own winPenPack Personal by following our Tutorial, an option that allows you to integrate into the winPenPack package your favorite software programs, and to customize wPP to suit your needs. winPenPack can be used both from a USB flash drive or directly on your PC hard drive; in the latter case, there is no need to install any programs or files. Once you have downloaded the desired edition from the download section, all you have to do is run the setup, or simply uncompress the ZIP archive into a folder of your choice: it will be immediately possible to run any application available in the wPP collection you chose. Individual programs are available for free download in the X-Software and Portable Software sections; they do not require any installation and do not leave their files or settings in the host computer. X-Software in particular have been designed and created specifically by the winPenPack Team, as they are not originally portable apps: they have been made portable by means of X-Launcher, a universal launcher. In the Portable Software section you will find exclusively native portable applications (they automatically save their settings in their own folders).